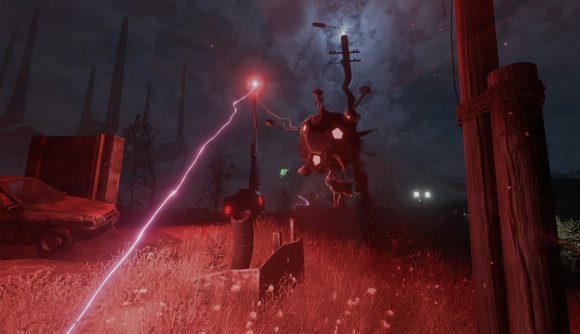 Free games: Win a Steam key for terrifying survival game The Light Keeps Us Safe! As a title, The Light Keeps Us Safe tells you quite a bit about the game it belongs to. You play in first-person and aim to evade hostile robots as you tread across a dark and desolate landscape towards salvation. So, a stealth game – but not your typical one. Darkness is usually your friend in a stealth game as it hides your form as you creep past patrols. Not so here. This is a world in which the sky has “gone out.” Yeah, it’s dark, permanently. That’s why these light-fearing alien-machines have managed to take over. Yes, they fear light – which means you can use it against them. What you’ll spend your time working out is where you can source light. A streetlamp will do, a spotlight would be better, and if you have to go scuttle to a flicker left by a burned out factory then so be it. You do, however, have a modular flashlight on you, which can be used to dazzle the nightmares chasing you. But it’s hardly something you can rely on. There are other threats to look out for along your journey, too. Whoopee! Yes, the machines have set up traps – poison, pitfalls, even hallucinations – that you’ll need to shine light upon, unless you want to risk your life on fumbling around in the dark. And that’s not even something you can chance when revisiting a certain area in the game, either. The Light Keeps Us Safe is the latest game by Big Robot, a studio that prides itself on pressing you to survive in procedurally generated landscapes – bleak ones, dangerous ones, beautiful ones. We had the bumbling British meadows of tweedpunk stealth shooter Sir, You Are Being Hunted. And more recently there were the bleak, abandoned highlands of A Signal From Tölva. Now we have the studio’s darkest game yet to tackle. If you want to give it a go, you can pick up The Light Keeps Us Safe on Steam. However, we have ten Steam keys that unlock the full game to give away. If you want to be in with a chance of winning one then all you need to do is enter the competition via the widget below. Every action you complete is worth one entry into the giveaway, with the more actions you complete increasing your chances of winning. We’ll also need your email address so we can send you a code upon winning – we won’t send you spam, we promise. Please read our terms and conditions before you enter.